WOLVERHAMPTON suffered another disappointing away defeat as they went down 60-32 against Swindon at the Abbey. 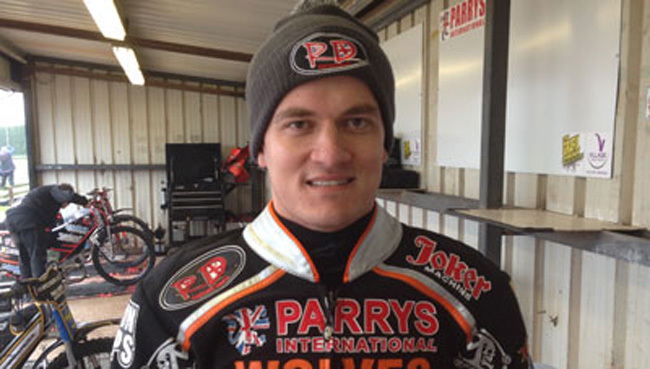 A sluggish start saw the Parrys International Wolves trail 15-2 after just three races – and although they improved as the meeting progressed they were unable to recover enough to challenge for a consolation point. It was another night to forget for the Monmore men as they continue to struggle on their travels – and promotor Chris Van Straaten was hugely frustrated by another tough night at the office. “It wasn’t the best of starts for us, and we were on the back foot from the very start,” said Van Straaten. “I think we’ve caught Swindon on a night where they know somebody is on the way out and are all keen to impress to keep their jobs. “We also caught them on a night where they had a guest for Miedzinski in the form of Hans Andersen who probably scored more points than Miedzinski has scored all season, and we are very low on confidence at the moment. American ace Wells battled valiantly to offer the bulk of the visitors’ resistance, claiming a tactical ride win as he became the first Wolves rider to take the chequered flag in heat nine. However, it was a tough night all-around as the visitors accounted for just four race wins including a determined heat 15 triumph for the impressive Wells. Their other victories came courtesy of Freddie Lindgren in heat 10 and Peter Karlsson in heat 13, but both proved rare bright moments for the Swedish duo who largely struggled. Jacob Thorssell battled hard but lacked speed on a tough night at No.2, whilst Tobiasz Musielak emerged unscathed from an awkward looking tumble in heat seven but added only four points. Reserve Lewis Blackbird was less fortunate as he withdraw from his final ride and travelled to hospital for x-rays on his ankle after hitting the deck on the opening bend of heat nine, whilst reserve colleague Josh Bates also endured a tough night. Wolves will aim to recover as they return to action on Monday as they welcome Leicester to Monmore Green (7.30). SWINDON 60: Grzegorz Zengota 12, Troy Batchelor 10+3, Kyle Howarth 10+1 Charles Wright 8+3, Hans Andersen 8+2, Lewis Rose 6+1, Nick Morris 6. WOLVERHAMPTON 32: Ricky Wells 13+1, Peter Karlsson 6, Jacob Thorssell 4, Tobiasz Musielak 4, Fredrik Lindgren 3, Lewis Blackbird 1+1, Josh Bates 1.